Pre heat oven to 375º F.
Combine flour, salt and baking soda in small bowl. Beat butter, sugar, Nesquik and vanilla extract in large mixer bowl until creamy. Add eggs one at a time, beating well after each addition. Gradually beat in flour mixture. Drop by rounded tablespoon onto ungreased baking sheets. (I like to line my sheets with parchment paper – it just makes everything easier!) Bake for 8 to 10 minutes. Cool on baking sheets for 2 minutes. Remove to wire racks to cool completely. Store these in an airtight container as they will dry out and get a little bit hard if they’re left out in the open for too long. 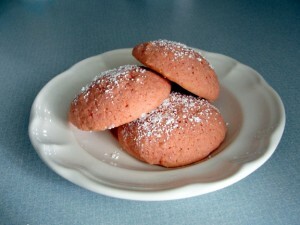 I sprinkled mine with some powdered sugar while they were still warm and I liked how they turned out! They’re pretty light and dainty, but the boys at the gathering I took them to gobbled them up and didn’t seem to be bothered at all by eating pink cookies. This recipe makes 30 cookies with my cookie scoop. I also added some ground flax seed - as I try to do with all my baked goods - but be careful not to use too much since it adds oil.